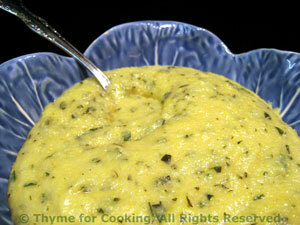 Thyme for Cooking Menus: Pizza Steaks with Creamy Polenta, easy recipes. For the Pizza Steaks, you can use a more expensive, tender cut, and serve medium or medium rare, or use a cheaper cut and braise with the sauce. 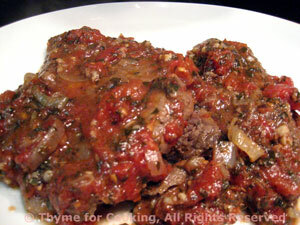 A thick sauce of tomatoes and oregano lend the 'pizza' taste to these steaks. You can simmer the steaks in the sauce for more flavor, if you like, be we prefer our steaks more on the medium rare side so we just spooned the sauce on top. Heat 1 tbs oil in small skillet over medium heat. Add onion, cumin, paprika and sauté 5 minutes. Add garlic and sauté 5 minutes longer. Roughly chop tomatoes and add to skillet along with wine and oregano. Reduce heat and simmer for 10 minutes, until reduced and thickened. Meanwhile heat remaining tbs of oil in large nonstick skillet or grill pan over medium-high heat. Add steaks and fry quickly, 1 - 2 minutes per side, depending on thickness and desired degree of doneness. When done, put on small platter. Spoon sauce over and serve. Note: If using a tougher cut, brown first, then add to sauce and simmer 15 - 45 minutes. Check the package directions for quantity proportion - you may have to add more (or less) liquid to get a soft consistency. It can be adjusted at the end, before serving. This should be quite thin, more like grits than mashed potatoes. Heat 1 cup (8oz, 240ml) stock and herbs in a small sauce pan over medium heat. Add cheeses and as much extra stock as needed to thin. Roasting vegetables browns them lightly, adding a crunchy sweetness from the natural sugars, and leaves all the vitamins and minerals safely intact. Cut cauliflower into florets (plus some stem). Put cauliflower and garlic into a small bowl. Add olive oil, lemon juice, salt & pepper and toss to combine. Put into a small glass baking dish, cover and roast at 400F (200C) for 15 minutes. 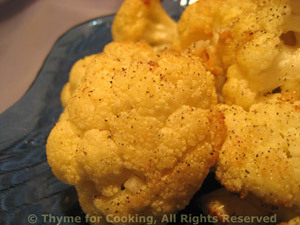 Uncover, stir, turn oven to 350F (175C) and roast 15 minutes longer or until cauliflower is tender and lightly browned. Remove, sprinkle with Parmesan and serve.